Acupuncture is a technique in which practitioners stimulate specific points on the body—most often by inserting and manipulating fine thin needles through the skin with the aim of relieving and regaining normal movement. It is a drug free mechanism of pain relief and is beneficial for a wide range of problems. Acupuncture is generally considered safe when performed by an experienced, well-trained practitioner using using clean-needle technique and sterile single-use needles. Research suggests that acupuncture can help relief various pain conditions very nicely as an adjunct to other physio techniques. 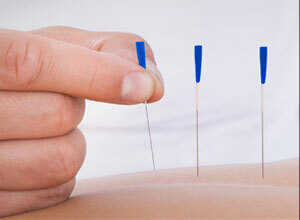 Traditional acupuncture involves needle insertion, moxibustion, and cupping therapy. Moxibustion : Moxibustion is a traditional Chinese medicine therapy which consists of burning dried mugwort (moxa) on particular points on the body. It can used indirectly, with acupuncture needles, or burn it on the patient’s skin. Moxibustion has also been studied for the treatment of pain, cancer, stroke, ulcerative colitis, constipation, and hypertension. Cupping : Through suction, the skin is drawn into the cup by creating a vacuum in the cup placed on the skin over the targeted area. The vacuum can be created either by the heating and subsequent cooling of the air in the cup, or via a mechanical pump. It is believed by some to help treat pain, deep scar tissues in the muscles and connective tissue, muscle knots, and swelling. It is employed in China today primarily to treat respiratory ailments such as asthma and bronchitis but is also used for arthritis, low back pain, depression, gastrointestinal problems and various types of pain. It also helps improve body qi flow.